WASHINGTON (CNN) -- Sen. Chuck Hagel, a leading Republican voice on international affairs and an outspoken critic of the war in Iraq, won't endorse either major-party presidential candidate in 2008, a spokesman said Tuesday. 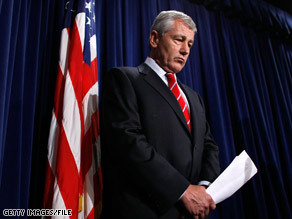 Sen. Chuck Hagel of Nebraska is leaving office after his current term. The announcement came just hours after a former GOP congressman suggested Hagel as a possible running mate for Democratic presidential candidate Barack Obama, one of Hagel's Senate colleagues. "Sen. Hagel has no intention of getting involved in any of the campaigns, and is not planning to endorse either candidate," Hagel spokesman Jordan Stark said. The two-term senator from Nebraska is leaving office after his current term and will be overseas on official business during this year's party conventions, Stark said. Hagel is a longtime friend of Sen. John McCain, the presumptive GOP presidential nominee, and briefly mulled a 2008 presidential bid of his own. But he has butted heads with McCain and other leading Republicans over the war in Iraq and sharply criticized McCain's campaign in July for its attacks on Obama. Tuesday, after endorsing Obama, former Rep. Jim Leach of Iowa, a Republican, said he hoped the Illinois senator would consider Hagel as his running mate or for "a serious position in an Obama administration." CNN's Alexander Mooney and Victoria Riess contributed to this report.